This was a four night cruise out of Fort Lauderdale with port calls in Key West, Florida and Nassau in the Bahamas. People like Celebrity Constellation. They always have. The fourth and final ship in Celebrity's Millennium class, Constellation has always had a good reputation as an elegant, premium cruise ship. As often happens with ships, it is some indefinable quality that gives Constellation an edge over her similarly-equipped sister ships. It had been a few years since my last voyage on Constellation but I was pleased to find that the atmosphere had not changed. There had been some physical changes - - more passenger cabins, more restaurants - - but the crew were still genuinely friendly and everyone, both passengers and crew, seemed to enjoy being aboard. There was a time when Celebrity Constellation was a large ship. Then it became a mid-size ship. Now, people are beginning to refer to Constellation as a small ship. Of course, Constellation has not shrunk, it is just that people's perceptions have changed since 2002 when she entered service. 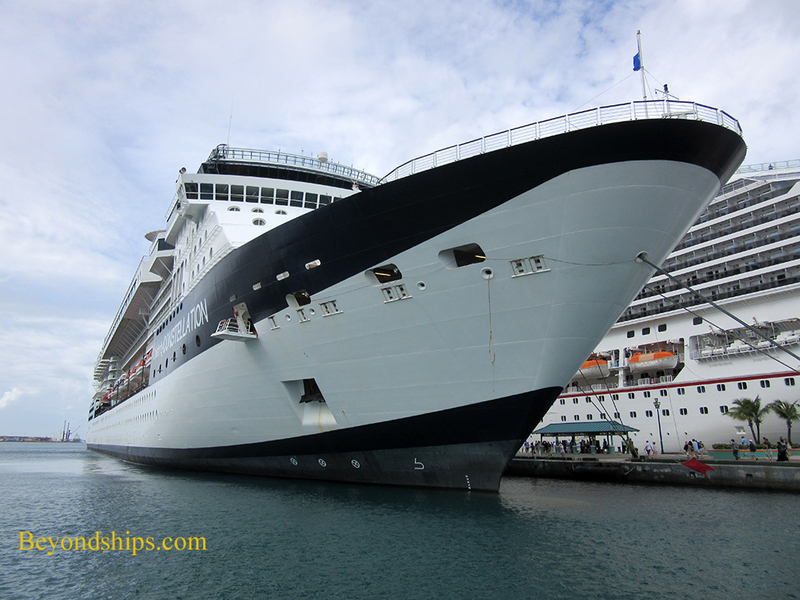 So many larger cruise ships have entered service since then and most of the ships that were smaller than Constellation have left service or been transferred to the secondary market where they are out of most cruisers' consciousness. Two things follow from these facts. First, because Constellation is a big ship, she has the space to carry an array of facilities and is able to offer a good variety of activities. For example, she has been retro-fitted so that she can offer most of the dining options offered on Celebrity's newer and larger Solstice class ships. The rooms used for these dining options may not be as large as on the Solstice ships but since Constellation carries fewer passengers, they do not have to be as large. Second, because she is smaller than the Solstice ships and the even larger ships of other lines, people now perceive Constellation as intimate and cozy. Thus, the ship offers both variety and the feel of a small ship. While there were more young people than before, the majority of the passengers were couples 50 and above. Quite a few were from Florida but many had flown in from other parts of the United States or from Canada. Since the ship had just re-positioned from the Mediterranean, some Europeans remained aboard. 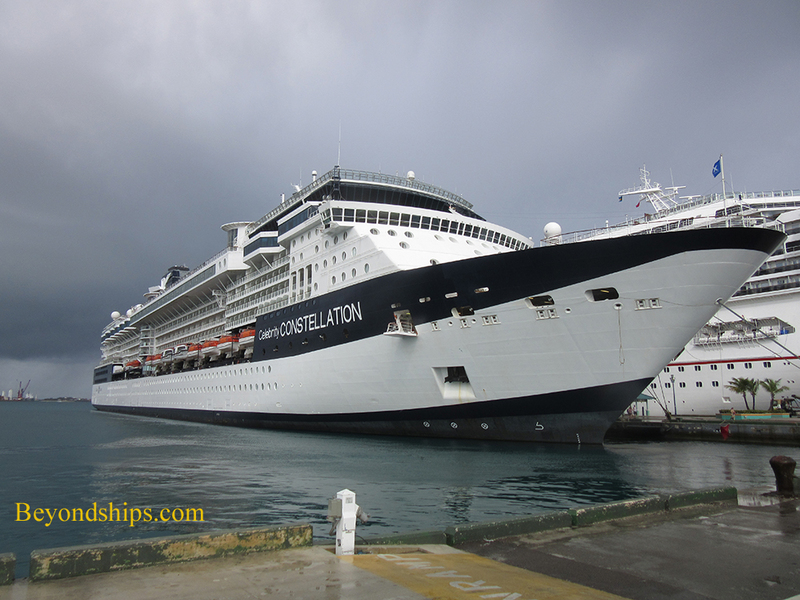 In general, the passengers were well-educated and appreciated Constellation's more sophisticated atmosphere. The ship was in good condition. There were the occasional scuff marks but, for the most part, the interior looked well-maintained. The exterior too appeared generally well-maintained. However, a sizable section of the artificial grass covering on top of the bridge had come off leaving the underlying metal exposed. Visible from Constellation's observation lounge, this unsightly area and gave an impression that was inconsistent with the overall look of the ship. Operationally, the only criticism I heard voiced was that the ship was too cold the first night. When a cruise ship is in port, the doors are often open as people come and go. On a hot day, the ship has to keep the air conditioning going at a high level to counteract the warm air that comes in through the open doors. Still, the air conditioning could have been turned down earlier once the ship was underway and had cooled down. Celebrity has a reputation for good food and Constellation did not let the side down. In the main dining room, each of the dishes I had were tasty and nicely presented. The portions look smaller than on some other lines. However, upon finishing each dish, I felt that I did not really need or want any more. The emphasis was on quality rather than quantity. The service was consistently good. Whenever my daily schedule allowed, I had breakfast and lunch at the Aquaspa Cafe. This is a small dining venue featuring healthy eating dishes. In addition to the various dishes offered buffet style, at lunchtime you can order the daily cooked entree or a salmon filet. These are cooked to order and then brought to your table by the friendly staff. I was impressed by each of the dishes that I had there. The Aquaspa Cafe is complimentary and is located in the adult (enclosed) pool area. From a nautical perspective, Constellation performed very well. Absent a tropical storm, the waters off southern Florida and the Bahamas are not much of a challenge for a large cruise ship. But, in any event, Constellation sailed so smoothly, it was difficult without looking out a window to tell if the ship had sailed.